What I call invisible interactions are interactions I never really noticed until they went missing. These are the truly usable and seamlessly designed interactions. Features I’ve come to expect without even knowing it. Below is a list of some invisible interactions that I have come to discover in my everyday computer use. Once they went missing for one reason or another I was lost without them. 1. 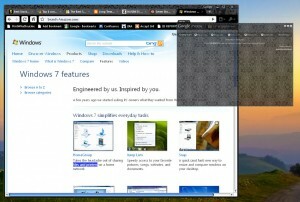 The ability to drag a tab out of a browser window into another window, or its own window. This is functionality provided by Google’s browser Chrome. I don’t think anyone told me I could do this, I know I didn’t look it up, I think one day it just happened and it just worked. I have two monitors, so it’s not uncommon for me to try and compare things. Things like prices compared across different websites, designs, pictures, or even just wanting to have one topic of tabs on one screen and another topic of tabs on the other. It wasn’t until I had to use IE for an IE only supported web app and tried to use this functionality that I realized how useful it is to me. 2. Omni Bars. This term is coined by the Google Chrome address bar area but is becoming more popularly used in other applications. The idea is that you can go to one place for everything. It’s a URL address bar, it’s a Google search box, it’s even a calculator. Specifically in Chrome it even has a couple additional delights like allowing you to search from within other websites like Amazon before you’ve even opened the site (after you’ve visited the site at least once so it’s in your cache, type “am” + tab you’ll see the “Search Amazon.com” feature appear, this also works for other sites by typing the first two letters of the URL). 3. 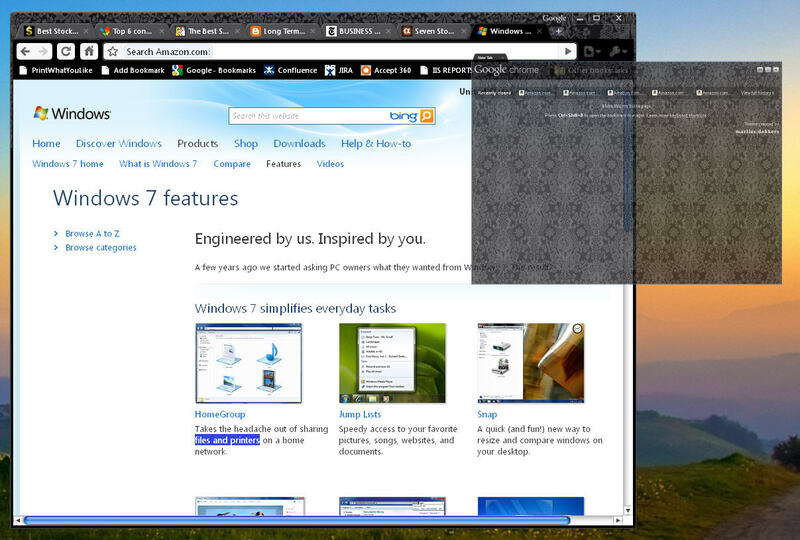 Windows Vista and 7’s start menu instant search. For someone like me who has probably 1 too many programs installed, this is a life saver. I didn’t even realize how easy it was to type in a program name and selected it from the list that appeared until I returned to my Windows XP computer at work and had to manually search through the All Programs list and folders to get to the applications I needed. I have even tried to get around it by installing icons of all the programs I use most frequently in the Quick Launch area of my toolbar. Still, when I’m at work and looking for something, I seriously miss that instant search feature. 4. Windows 7 Snapping. I knew this one was coming, but honestly didn’t think it would be of any use to me, until I used it on accident. Similar to my tab separating in #1 above, I need to compare two things on my laptop, but they were not in browsers so Chrome was no help. I was in the process of trying to size them vertically next to each other ever so nicely so they each had half the screen real-estate when one of the windows snapped perfectly to the left side of the screen. It was an ‘ah-ha’ moment that put a smile on my face, and now another feature I miss when using my XP computer at work. 5. Add in Place. I’m an on the go type of person, constantly moving around. Therefore it’s important to me to be able to easily access and schedule things in my calendar. I’m a post-Outlook user, and a current Google Calendars user. So when I found out I was going to be using Lotus Notes at work I was less than thrilled. I am on Lotus Notes 8 and one thing I can never seem to learn in that program is that you cannot click a time slot in a calendar and start typing an entry. It just doesn’t work that way. If anything it will attempt to do a calendar search instead. To enter an appointment you have to very specifically click the new button above the calendar, then choose the date and time from text boxes. This takes a lot more mental thought from me then the point and click I am used to and had taken for granted before. 6. Drag and Drop. While it is still not a totally known interaction to most novice computer users, once you know about it, it’s a hard one to give up. I think because it is so closely tied to our real-world mental model of moving things. One of my co-workers mentioned that he specifically likes to drag and drop highlighted text from one application to another. He claims this works seamlessly in a Mac, yet is hit and miss on windows. It always throws him for a moment when he has to remember to specifically copy, and then paste instead of dragging. 7. Spell Checker. Oh how I love thee. Here is a perfect example of invisible. As I was typing away at this blog, I didn’t even notice that the normal squiggly misspelling underline indicator wasn’t appearing. It wasn’t until I was about to publish this post that I took a second thought and decided to paste it into Word. See, I am using IE (against my will) at the moment, and it doesn’t have a pervasive spell check like Chrome. However I am a horrible speller by nature (I’m a visual person, I like to spell the way I think the words should look) and this little nicety is sorely missed not only by myself , but those who suffer through my post when spell check is absent. Thank goodness I thought to put this in Word before posting. Nice article! i never thought of these things as “invisible interactions” before, but it makes a lot of sense. My favorite example of this is with Label in Gmail. For years you would create labels at will and those labels would appear to the left, like folders. But recently they did a redesign and labels are not all hidden inside of a label drop down. So instead of easily checking all my label at once, i now have to open the label drop down and scan down the list. I like the concept – invisible interactions 🙂 I pull tabs out all the time, very handy – but not something I think about. Can’t imagine life without spell checker!